IQS Directory provides an extensive list of rotomolded tank companies and suppliers. Utilize our website to review and source rotomolded tank companies with our easy-to-use features which allow you to locate rotomolded tank companies that will design, engineer, and manufacture rotomolded tanks for your exact specifications. Our request for quote forms make it easy to connect with leading rotomolded tank companies. View company profiles, website links, locations, phone number, product videos, customer reviews, product specific news articles and other production information. We are a leading manufacturer directory who will connect you with the right manufacturers whether you are looking for plastic rotomolded tanks, polypropylene rotomolded tanks, or custom roto molded tanks. We specialize in tanks suitable to serve a variety of industries. We offer an assortment of sizes from 65 gallons to 800 gallon tanks. All of our products go through rigorous testing to ensure the quality and safety. Our design team loves a good challenge so if you need a custom tank, choose Sherman Roto Tank. Fibertech, Inc. is able to supply customers with the rotomolded tanks they need. With an extensive line in addition to their ability to create custom parts, you can rest assured that they will find the perfect product for your application. They also provide a wide range of additional services to make sure that all needs can be met. Call Sterling for a quote on your next project. Rotomolded tanks are our specialty. We manufacture our tanks from both polypropylene and other types of plastic. We believe in offering quality and fast turnaround times. Our multiple plants help you get your tanks anywhere in the US fast. It is our goal to offer tried and true manufacturing methods combined with new technologies to help you meet your needs. Contact us for details today! We provide custom designed rotomolded tanks in order to better serve you. It is our goal that we are able to consistently exceed customer expectations on all products and with every business encounter. We take great pride in turning first time customers into lifelong connections by displaying excellent customer service skills and lasting product value. For more information on how we are able to assist you, visit our website today! Rotomolded tanks are hollow vessels that are fabricated from thermoplastic materials to contain and store a wide variety of materials. They are known for their impact resistance, high tensile strength and wide design range. Rotational molding is an inexpensive process that uses rotation, heat and a mold to form many different products, the most popular of which are plastic tanks. Rotomolded tanks exhibit uniform wall thickness, the ability to have threads, fittings or hardware attached and many different color options. They are mostly used in industrial applications for the food and beverage processing, fuel and oil, chemical, pharmaceutical, marine, wastewater treatment, agricultural and medical industries. Their seamless, single part construction protects against fractures and leaks, which leads to a longer lifespan. They have many benefits over metal tanks, which can corrode and oxidize and are difficult to install. Rotational molding is also the most beneficial method of producing plastic tanks, compared to other thermoplastic fabrication processes like welding. There is also very little material wasted, unlike thermoforming, injection molding and blow molding, all of which have extra scrap pieces of plastic that are removed from the newly formed tanks and require costly assembly. Rotationally molded tanks are made of a few different thermoplastic materials, including polyethylene, polypropylene, Halar and polyvinylidene fluoride, all of which are high purity plastics. To enhance properties like strength, moisture, chemical and temperature resistance, color and flame retardancy, the plastic resin often contains additive materials, depending on the product's application. 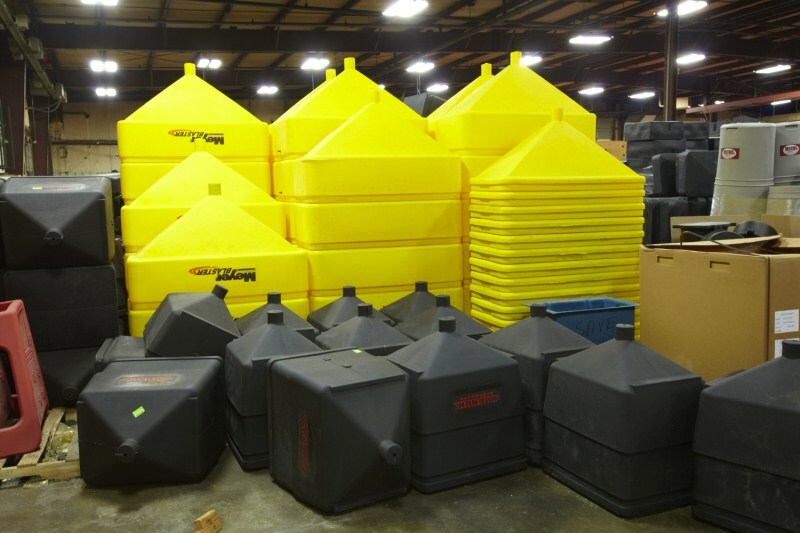 Since plastic tanks are generally some of the largest products fabricated from rotational molding, manufacturers employ the largest rotomolders to produce them. They require a large amount of space, an area where high heat can be reached and a cooling location, both of which must be big enough for the rotational molding machine to revolve around two different axes if necessary. To fabricate the tanks, the polymer resin is always in fine powder form, in order to better reach all corners and sides of the tank-shaped mold. Since the process is carried out under low speeds and low pressure, even distribution of the plastic is sometimes a concern. However, if the plastic granules are fine enough, complex designs such as two-compartment tanks are possible. Rotomolded tanks are designed to be either horizontal or vertical in orientation, and may hold anywhere from a few gallons to several thousand gallons. Rotomolded Tanks - Sterling Technologies, Inc.